Benny arrived at the shelter with a litter of puppies. He was the only puppy from his family that never got adopted. He lived at the shelter for over three months in a stainless steel cage, getting out only occasionally. I took him to several "meet and greets" in hopes of finding him a new home. But it never happened. People constantly overlooked poor little Benny. I felt bad every time I went to the shelter and still saw him sitting there. I had about 12 dogs at the time and felt we just could not have any more. But finally one day I knew that if I did not take Benny home, he would be put to sleep. Somehow, he had managed to stay alive much longer than most at the shelter. Maybe because he was cute and never was very large so the staff kept forgetting about him. Living at a shelter for three months is not good for a small puppy. Puppies need to be socialized and handled, they need loving attention. Benny still seemed like a very nice dog in spite of his shelter upbringing, but he was very fearful of many things. That is probably the reason that he ended up in many fights with the older dogs in our home. He never fought with the younger female shelter dogs, but always with our older, large dogs. 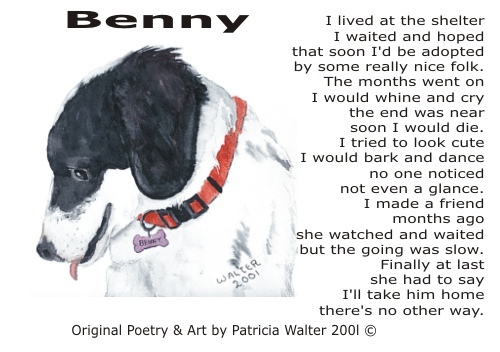 We had never experienced such fights with our dogs and felt very badly for Benny. He stayed with us for a year and a half, but the fights continued. One day he had a terrible fight with our large collie mix and I knew he needed to find a home without other dogs. Finally we found a family in Dover DE to adopt Benny. He was to be the King of the house. We did not want to let Benny go, but we knew he needed to be away from our large doggie family. We got in the car and took Benny to Dover DE to meet his new family. I don't think Benny ever got over his upbringing in a shelter and remained fearful in many situations. Puppies need love and attention - most shelters just don't have time or staff to give little puppies what they need. Many shelters have a great foster network where puppies are raised in a home environment until they are ready to be adopted. But many poor shelters don't have such programs and the animals suffer greatly due to the lack of funds and volunteers to work with the animals. If you feel you could help to make life better for shelter animals, please volunteer at your local shelter. by some really nice folk. but the going was slow.